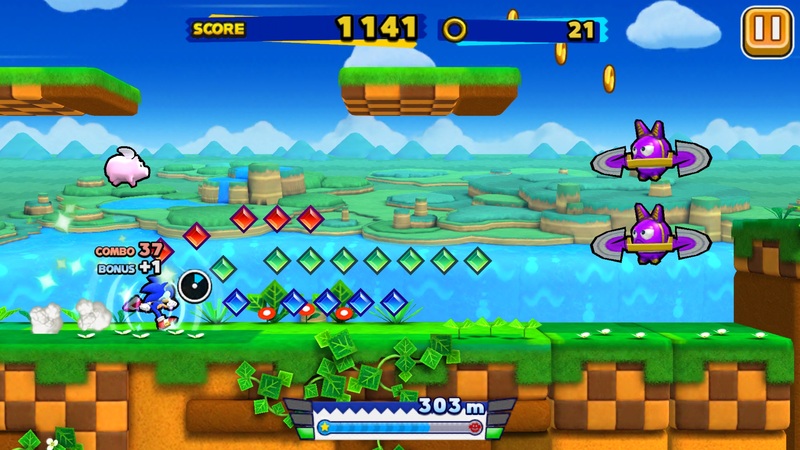 Take a few moments to appreciate Sonic Runners before it goes away with this guide! Sonic Runners is ending next month, and if you never gave it a chance you might well regret that you never did. My advice? Go ahead and download it right now while you can, and get in a solid month's worth of gameplay. While Sonic Dash is still available, it's always a sad time when any games are taken away from your grasp, especially when they're free. Take these tips and tricks to heart and get what you can out of the decent little endless runner before it's yanked from the App Store. Make sure you level up accordingly. In Sonic Runners there's a special system according to which characters you use, and you can gain levels by spending rings and earning EXP when you complete levels. If you can't or don't want to level up each character you might decide to concentrate on just one runner, which you'll benefit from when it comes to other bonuses. You want to try and keep your Score, Animal and Ring Bonuses up, though, so focus on one character a time. Sonic happens to be one of the easiest to focus on here, so that might be your best option. When you reach the Eggman segments near each segment, try and drag them out. Each time you hit him you have the possibility of earning Red Rings and other rings that bump your score up as well as your Ring Bonus. Speaking of leveling up characters -- this is definitely something you want to focus on. Depending on how long you've been running already, you've got quite a few opportunities to amp up your score with score gems Eggman drops as well, so try and keep these encounters as long as you possibly can. Think of them as special bonus rounds, and you'll be racking up the goodies in no time. Sonic may be the fastest thing alive, but he's also got some air when he leaps. Sonic can make three consecutive jumps as part of each area, and that means you can reach the higher parts of levels rather than being relegated to the lower and mid lanes. This often means you'll get more rewards by aiming higher, and you'll probably have an easier time of collecting them as well. It might sound easy on paper, especially when you're not having to worry about actually playing, but aim to keep your combos as tight as possible. If you can finally reach over 1000 you'll get a bonus of +50 to your stores, and this will ensure you receive more items than you need. Then leveling up is only a hop, skip and a jump away.